Following the capture of Bardia, the 6th Australian Division advanced west along the Libyan coast to the Italian defended port town of Tobruk. At dawn on 21 January 1941, after air and artillery support, the 6th Division broke through the Italian lines in the south and by 8 am the entire division was within the Italian perimeter and fanning out into the enemy enclave. The stiff fighting on the opening day was not repeated on 22 January when 25,000 Italians surrendered and hundreds of artillery pieces and vehicles were captured. The capture of Tobruk was followed up by the British 7th Armoured Division and the 6th Division. Benghazi was captured on 6 February and the advance culminated on 10 February at Beda Fomm on the western frontier of Cyrenaica. Following the capture of Benghazi, the British War Cabinet directed that the major effort should go to support Greece and that Cyrenaica was to be held with minimum forces. The 6th Division was replaced by the inexperienced 9th Division which unexpectedly was to see action much sooner than anticipated when the German forces under General Erwin Rommel launched a counter offensive on 31 March. 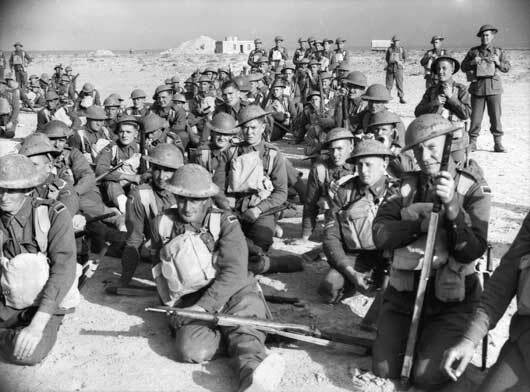 By 9 April, the 9th Division had withdrawn inside the Tobruk perimeter and was soon besieged. The main defenders of Tobruk were the 9th Division and the 18th Brigade of the 7th Division commanded by Australian general Leslie Morshead. German tanks attacked the Australian perimeter on 13 April and were thrown back with 17 tanks destroyed by British artillery. The same day, John Hurst Edmondson became the first Australian to be awarded a Victoria Cross during the Second World War. His award was posthumous. The siege of Tobruk lasted 240 days but from August the Australian were gradually relieved being evacuated by ship to Alexandria. 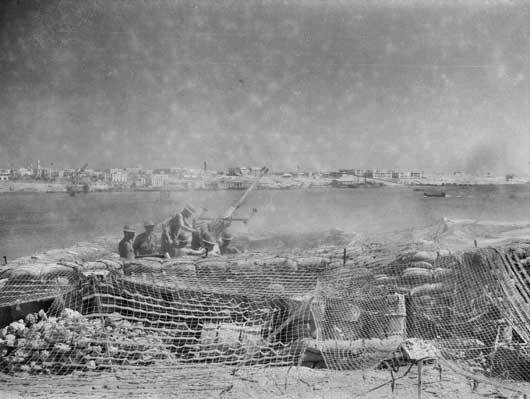 However, one battalion, the 2/13th Battalion remained in Tobruk until the British offensive, Operation Crusader relived the town in December. Like the fighting on the Kokoda Track, and the First World War battles at Gallipoli, Tobruk holds a special meaning to many Australians. Men of the 1st Anti Tank Company in Tobruk (AWM 005858). 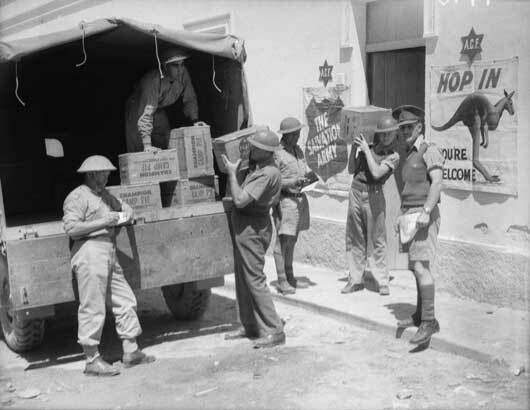 Salvation Army and AIF personnel loading comforts fund items on to a truck for distribution to the troops (AWM 007478). 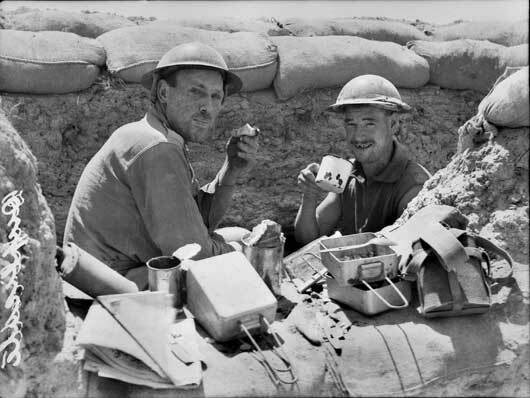 Lance Corporal Frank Smith and Corporal W. Brownrigg of the 2/23rd Infantry Battalion eating lunch whilst on watch in a fire bay (AWM 020502). One of the Bofors 40mm anti-aircraft guns in action on the harbour front (AWM 020737). 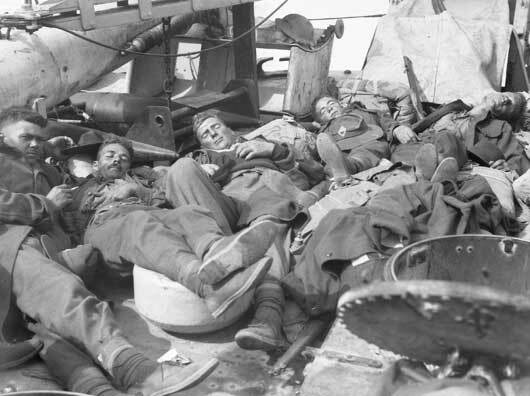 Australians of the 9th Division take a well-earned rest during their evacuation from Tobruk to other Middle East ports by units of the Royal Navy (AWM 021154). 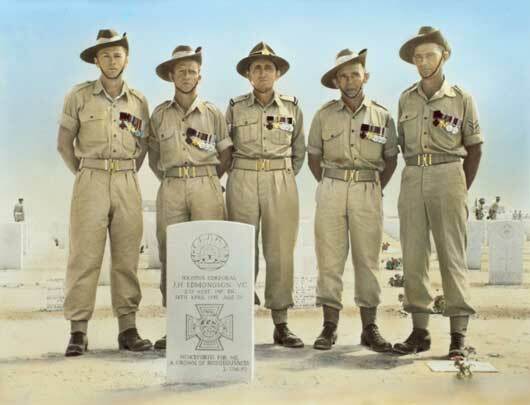 Five Victoria Cross winners of the Australian and New Zealand Coronation Contingent in the Tobruk war cemetery, standing behind the grave of J.H. Edmondson (AWM P01895.001). 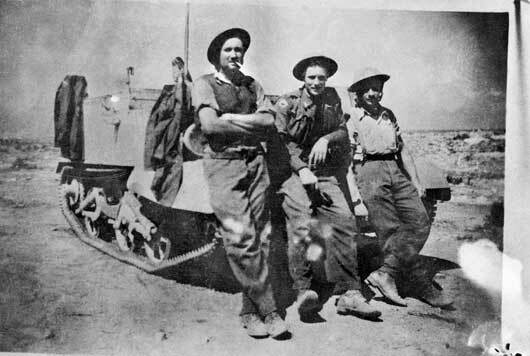 Members of the Bren Gun Carrier Section, 2/48th Battalion, two days before the raid on Carrier Hill during the seige of Tobruk (AWM P02688.001).